Get your moneys worth at the Quality Inn and Suites hotel in Quakertown, PA located off Interstate 476 near John Fries Highway. We are near Desales University, Sands Casino, Bear Creek Ski Resort, Sellersville Theatre and Nockamixon State Park. Get more value with amenities like free hote breakfast, free WiFi, free weekday newspaper, a fitness center, a business center and free parking. Our guest rooms feature refrigerators, microwaves, coffee makers, work desks, hair dryers, irons and ironing boards. 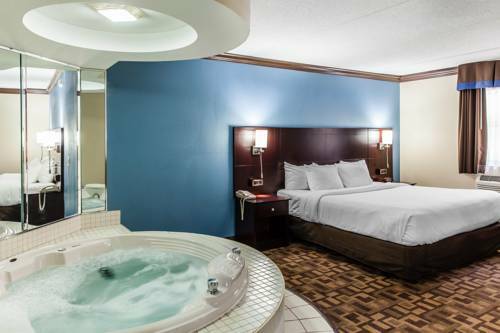 Some suites also have a hot tub bathtubs and sofa sleepers. Also, earn rewards including free nights and gift cards with our Choice Privileges Rewards program. Heart-shaped headstone for the bombshell starlet and former rival to Marilyn Monroe. Location for a memorable scene-of-terror from a 1950s sci-fi movie. A fun medical museum of human pathology, but so dignified that you almost forget that you're looking at skulls, conjoined twins, and a giant colon.